PALO ALTO, CA – The once rumored Android-based HP SlateBook is expected to hit markets this July, sporting a high-tech Tegra 4 processor and running on Android 4.3 Jelly Bean. The upcoming SlateBook is only one of several other laptop models that HP (NYSE: HPQ) plans on releasing soon. The HP SlateBook will be one of the first laptops made by a major company to run on an Android processor, something that HP is excited about. “Customers have made it clear that they need devices that better adapt to work and play the way they do. Today, we are announcing the next generation of laptops and two-in-one PCs, along with a new Chromebook that combine power, versatility and design for home and on the go,” said Mike Nash, vice president, Product Management, Consumer Personal Systems at HP. The two-in-one PCs are devices that can be used as both a laptop and a detachable tablet. While HP is planning on making those later in the year, the HP SlateBook will only function as a laptop. It will feature a touchscreen, however. 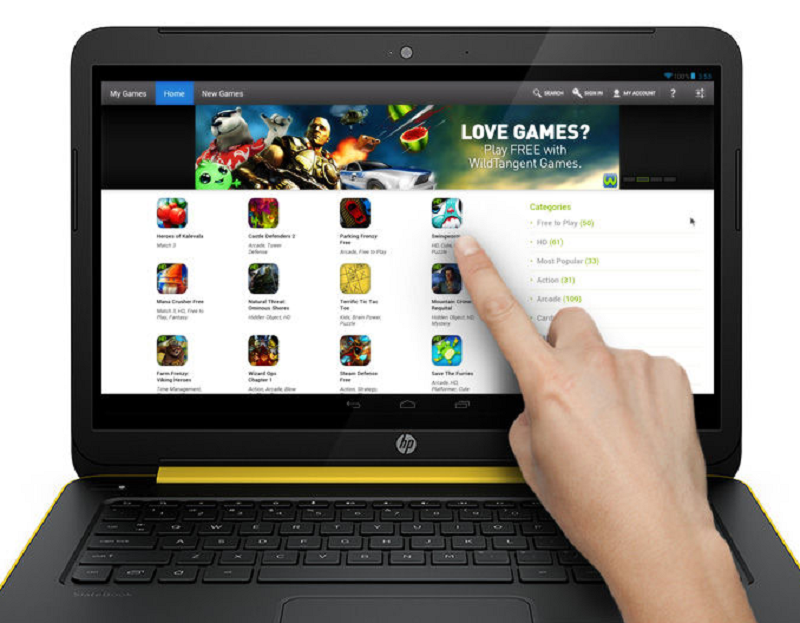 The upcoming HP SlateBook’s touchscreen allows for users to use the laptop in new ways. While the 10 point capacitive touchscreen can be used alone to navigate the menu system, users uncomfortable with that can also stick to using the laptop’s familiar keyboard and touchpad combination. While the laptop’s Tegra 4 processor is not as powerful as some of NVIDIA’s other models, it is still more than capable of giving users a great experience. The chip will be using four ARM Cortex-A15 processors and will have a GPU with 72 custom cores. Even with all that firepower, the device will still be able to last up to 9 hours on battery power. On top of that, the HP SlateBook will also have four Beats audio speakers that seek to give users a next-generation sound experience. The device will also utilize the Google Play Store, meaning that millions of apps will be available for people to purchase and use. The only downside to the device is its low amount of storage space. While normal laptops have hundreds of gigabytes to fill up, the HP SlateBook starts at 16GB, with options to get more space but spend more money in doing so. Even so, the millions of apps, high-tech audio system, and touchscreen will perhaps overshadow the lack of storage space. The HP SlateBook will be available for purchase on July 20th, and will start as low as $399 for the 16GB model.